BTS’ Burn the Stage originally took form in a docuseries on YouTube Red. The series premiered on March 28, 2018 and, over the course of eight episodes, followed BTS members around during their sold-out Wings Tour. Fans might wonder if there’s already been a docuseries covering the tour, is there a justification for bringing Burn the Stage to the big screen? Rest assured, most of the film consists of new footage not shown in the docuseries. 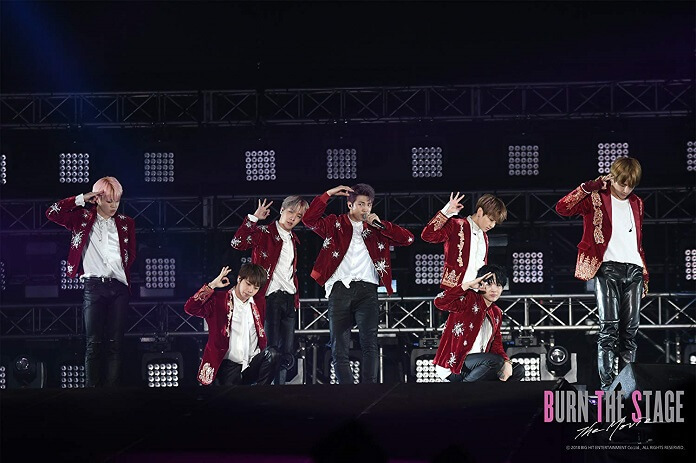 BTS’ Burn the Stage: The Movie opened on Thursday, November 15, 2018 in limited theaters and grossed more than $3.6 million domestically during its first four days in release. $2.3 million of that was over the weekend, and that weekend gross was large enough to earn it a spot in the Top 10 at the box office. Throughout the film we’re provided with a glimpse behind the scenes at what takes place during the tour including stage rehearsals along with what takes place during the concerts, like wardrobe changes and hurrying to the next stage performance. Concertgoers are aware of the maneuverings on stage, but fans don’t necessarily stop to consider what else occurs backstage. BTS allows fans the opportunity to understand the exhaustion and injuries that occur on tour, whether it’s through watching ice being placed on the back of their necks to help cool down in brief moments or members of the group grimacing in pain before they jump up ready to give their all again. We’re even offered the opportunity to witness moments of self-doubt when a member doesn’t hit the right note. Basically, the audience is forced to see the group as just humans who give it their all to put on an amazing concert for their fans. The documentary also features interviews with each member of BTS. They share their thoughts on not only the tour but life in general as a group. They speak highly of their fans, which isn’t surprising as they’ve always credited their success to their ARMY. Their lighter sides are brought forth as well throughout the nearly hour and a half running time. Burn the Stage includes scenes of the group goofing around and letting loose, enjoying their days off by either shopping or enjoying a BBQ complete with drinks and pool time. One of the main noticeable differences between the docuseries and the movie is the film’s narrated throughout by each member of BTS. Each part’s like a metaphor for their journey of being in a desert trying to reach the mirage, in this case the mirage being them trying to reach their hopes, dreams, and goals. The film’s entertaining, however fans might find the docuseries better in a number of ways. The docuseries gave fans more from the BTS members and delved further into their thoughts and feelings. It’s also worth noting the docuseries shares more of what transpires behind the scenes. In the docuseries, while performing in Chile youngest member Jungkook was having trouble with the altitude and admitted he didn’t prepare his body well enough. The docuseries shows how he transformed from being on the verge of passing out and needing oxygen to being able to get up and finish the concert without his fans ever knowing any of that went down. Moments like that are missing from the movie, and their inclusion could have helped paint a better picture for those who don’t really follow BTS or those who are still on the fence about the group. However, even with its flaws Burn the Stage: The Movie still does BTS justice in showing their hardships along with the success of not only the Wings Tour but the rising global success of a Korean boyband.